I like Nasi Lemak, the star of the dish is not the coconut rice and all the fancy sides that go with it. The star for me is the sambal chilli. Having tried this recipe, I realized it is not too difficult to enjoy this delicate condiment with the help of the food processor. I only used the mortar and pestle in the picture to pound the balacan 🙂 The sambal paste is prepared with the help of the food processor; use technology efficiently! 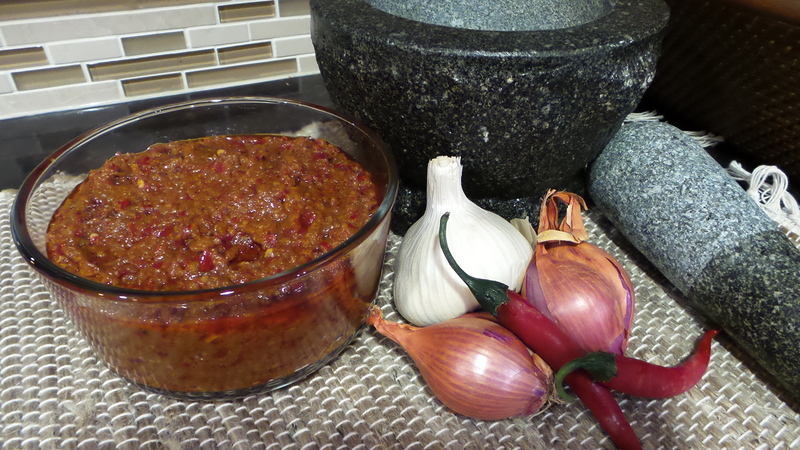 This recipe makes about three cups of sambal chilli. Well worth the time invested! Remove stem and seeds of dried chilli. Snip each chilli pod in half and remove the seeds while dry. Soak the chilli pods in hot water for two hours. Rinse and squeeze dry. Remove stem and seeds of fresh chilli. Cut into small segments. Prepare remaining ingredients for sambal paste. Pulse all ingredients of sambal paste in the food processor to a fine consistency. Heat oil over medium heat and add sambal paste into wok. Stir fry for 10 minutes. Add tamarind juice, salt, msg, and gula melaka. Cook for another 20 minutes, stirring constantly. Add 2 Tbsp of thick coconut milk, cook for 2 minutes. Add the other 2 Tbsp of coconut milk, cook for another minute. Turn off heat. Cool completely and store in air-tight container in the refrigerator.